Final Results are now available online for the Northwest Cross Country Series. Just click on the Birchwood link to take you to a .pdf file. Sunday saw the last race in the series at Birchwood Forest Park starting at 10.00am, a 4 lap course which is an open route for spectators to watch proceedings but also interesting at 4 laps for the runners. Total distance seemed to be just over 5 miles. Julian from Spectrum did a small rain dance Saturday night to fill his pond but unlike previous years was more of a puddle, still, it’s good fun for a splash or two as you’ll see on the various photos available. For anyone following this series they’ll know how close Helsby ladies were to putting their name on the silverware (with the joint help of Lymm & Warrington) but with some of the key Helsby ladies from previous races missing it was going to be a tight call as to whether they would win on the day. Jayne Joy did all she could and more to bound home as overall ladies winner, a phenomenal achievement considering she was 17th in her first race of this series. Janet Robertson followed brilliant for a 13th position finish. There were 43 ladies in the race. Unfortunately on the day the women just missed out on top spot to finish 2nd team. It was now going to be a close call as to which ladies team would win the trophy overall! Stay tuned…..
With Joe on his knees asking for runners on Wednesday night it was a delight to see some new faces for the cross country. With Jim O’Hara as energetic as a cat on a hot tin roof, and this was after running a fell race in Shropshire on Saturday and Colin running his first race in a green vest, Adrian, Adair and Andy meant we had a good team for the day. Some brilliant runs were had too, Jim took his good road form onto the fields to worry Adair who came in 11th although Jim was looking over his shoulder to see where Jayne was he still finished a strong 30th , and with Colins first cross country event to finish 42nd shows his potential. Fastest finish of the day went to Adrian and I think his highest position yet at 77th, Andy tidied up the Helsby pack for 97th. With the other runners from Lymm and Warrington this placed Helsby men’s team 5th on the day and fifth overall in the team series. But what about the ladies final team position? Waiting for the results was admittedly quite tense, especially as Steve Saunders (series organiser) kept everyone guessing till the very end due to it being a tie between the two top ladies teams! 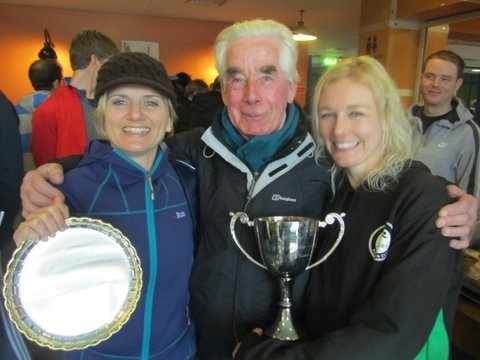 After countback big cheers and delighted faces all round as Helsby were mentioned as Northwest XC winners and for the first time will have their name engraved on the trophy! Massive congratulations not just for those who ran on the day but for all Helsby participants in the series, a job well done and I’m sure enjoyable too (well maybe after the races at least). There was much support on the day too, with Joe and Mario keeping us going each lap and Jackie taking photos. Thanks also to Kathryn and Steph. It has been a delight to be in a race and be part of a successful cross country season for Helsby and hopefully is just the start of future success. All bodes well for next season! Special thanks also to Jackie for a brilliant photo/video of the race that completely sums up the day and post race celebrations! Well worth a watch and something to show your friends and family I think. I’ve also attached a photo from Jackie to the email. Lastly, thanks to Andy Smith for the well earned round of drinks! This entry was posted in Uncategorized and tagged brichwood xc, cross country, northwest xc results, spectrum striders, steve saunders. Bookmark the permalink.